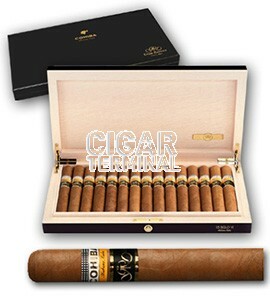 The Cohiba Siglo VI Gran Reserva is a refined medium-to-full bodied Canonazo, 5.9” (150mm) long, of 52 ring gauge, and comes in a cabinet of 15 cigars. Those precious leaves, after five years of care, are then laid in the skilful hands of Cohiba´s expert Cuban cigar-rollers at "El Laguito" factory in order to create this exquisite Habano for the most distinguished smokers. Furthermore, the emblematic vitola "Siglo VI" (girth 52 x 150mm length) has been chosen for the production of this first Habanos Gran Reserva.